MILWAUKEE — Giannis Antetokounmpo won the scoring matchup, but Joel Embiid and the Philadelphia 76ers won the game. "He's (Embiid) a tough guy," Antetokounmpo said. "He's a great defender, strong. It was kind of hard going at him." The Sixers' defence shut down Antetokounmpo in the first two quarters. He was 5 of 13 from the floor and had 17 points and seven rebounds before going 10 of 13 from the floor and 14 of 16 from the line for 35 points in the second half. "I thought we all did a pretty good job in the first half," Embiid said. "In the second half, he kind of got going. He is tough to guard." 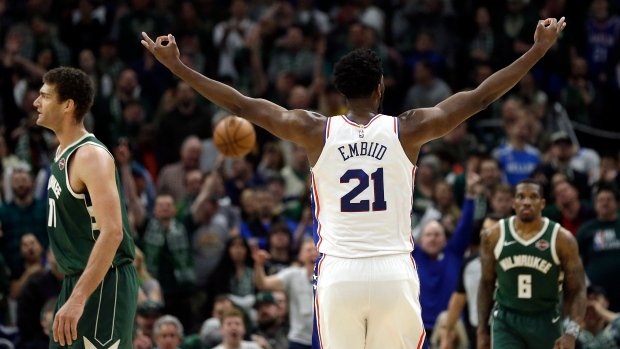 "They are the best team in the NBA right now, as far as record goes," Embiid said. "No. 1 in our conference. I felt like we had to make a statement. We had to get this win." Milwaukee had a brief scare when Antetokounmpo was fouled on a driving layup and landed awkwardly late in the third. He got up favouring his right leg, but then sank one of two free throws. Scott also provided a fun highlight — late in the first quarter, he made a dive into the stands trying to save a loose ball. He landed in the second row, surprised a fan by taking a quick sip of her drink, and ran back on defence as play continued. 76ers: Philadelphia moved to a season-high 20 games over .500. . The Sixers had 21 second-chance points to the Bucks' 11. After using 20 different starting lineups, Philadelphia's current quintet of Butler, Harris, Embiid, Redick and Ben Simmons played together for just the seventh time and improved to 6-1. "This was only our seventh game having everyone healthy," Redick said. "Sixers 3.0 for this season. We are still trying to figure each other out, but to get a win like this on the road is huge."